Located in Santa Clara County in the Silicon Valley area of California, San Jose is one of the state's biggest cities. It's the largest city in all of Northern California in terms of both size and population, being home to over a million people. This makes San Jose the third biggest city in California, trailing only Los Angeles and San Diego in terms of its population, and the 10th most populous in the country. Covering almost 180 square miles, San Jose is a huge city and a key cultural and economic hub for the state of California. It's a global city, renowned for its innovation, warm weather, technological advancements, strong economy, and more, being the home of the headquarters of many globally-recognizable tech brands like Samsung, eBay, Hewlett Packard, and Adobe Systems. As well as its many major tech companies, San Jose is also a prime tourist spot, home to various unique attractions and landmarks, as well as being conveniently located near some of the best beaches and natural areas in all of Northern California. Places to check out in and around San Jose include the bars, shops, and restaurants of the Downtown district, the Sunol Regional Wilderness park for outdoor recreation, the allegedly haunted Winchester Mystery House, the Happy Hollow Park and Zoo, the Tech Museum of Innovation, the Children's Discovery Museum of San Jose, the Japantown district, and more. The city has a lot to offer and is a must-visit location on any road trip or RV tour of Northern California, with dozens of great RV parks and campgrounds in the area. See below for full details and contact info for some of the very best RV parks in San Jose to help you choose the right accommodation location for your next trip. Located near the center of the city, Garden City RV Park is a great option for guests who really want to explore San Jose and make the most of every single day of their trip., No matter whether you're interested in fine dining establishments, awesome shopping areas, fascinating museums, or something else entirely, you'll find it within just a few minutes of this perfectly located RV park, which has received plenty of positive reviews over the years for its facilities and service. Garden City RV Park offers plenty of full hook-up sites with 30/50 amp electricity. 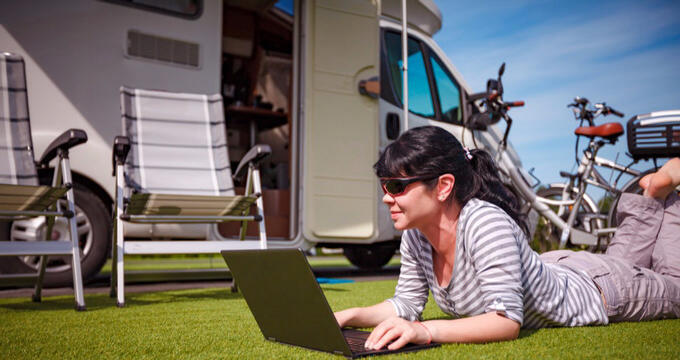 You'll also find water and sewer at your RV site, so you'll be getting all the standard utilities you would expect from a good quality RV park. High speed internet access is offered on a complimentary basis too, and all guests will be given access to the on-site restrooms, hot showers, and laundry area with coin operated washers and dryers. It's also worth noting that this is a pet friendly San Jose RV park, so you can bring a dog or other furry friend along for the ride without any worries or problems. Too often, RV parks are located right on the outskirts of the city, meaning you have to drive in and out or rely on public transport to get around each day and see all the areas and attractions you want to check out. At Trailer Tel RV Park in San Jose, that's not the case at all. This RV park is right in the heart of San Jose, mere minutes from all the biggest and best areas and most popular touristic landmarks. Fully suitable for both short and long term stays, this RV park has been perfectly designed to ensure every guest has the best experience. Trailer Tel RV Park offers luxury facilities with spacious RV sites and paved roads to help you get around with ease. It features a total of 170 full hook-up sites with 30 amp power and all of the other standard utilities you would expect. You'll also find a swimming pool on site, along with a fitness center with various exercise machines, a large laundry area filled with coin operated washers and dryers, a car wash station, telephone hook-ups if you need them, a communal lounge with comfortable seating, and high speed wireless internet access for all guests. This is a pet-friendly site too, but only small pets are allowed, so be sure to read up on the rules before booking your stay. Ranked as one of the best RV parks not just in the San Jose area, but in the entire Bay Area, Coyote Valley RV Resort is located on the outskirts of the city of San Jose in Morgan Hill. It provides a peaceful haven, perfect for guests who really want to get away from it all and enjoy some time in a tranquil, calm location, while also offering relatively direct access into the city and all of its attractions. Rated as a 10-10-10 RV park, you know you're going to enjoy excellent facilities and amazing service here. Coyote Valley RV Resort offers great rates, with daily prices starting at just $70 for deluxe sites or $80 for premium sites, and you can save more money on your stay if you choose to book for a couple of weeks or even a month. The on-site amenities at this luxury RV park include over 120 sites with 20/30/50/100 amp power, speedy internet access, cable TV, a massive clubhouse with flat screen TV and kitchen facilities, a huge swimming pool and spa area, free coffee making facilities, a convenience store selling plenty of useful items and essentials, a pet park for your canine companions, full concierge services, garbage disposal, dog walks, game areas, an RV washing station, private patios with grills, a fitness room, a firepit, and a laundry area too.